The list of materials we recycle (and compost) at our Center is long and constantly changing. Please click here for a complete list, and call 214.566.3025 if you are unsure whether we accept a particular item or not. If we can't take an item, we'll always try to help you find a place that does. Traditional (FREE): paper, plastic, aluminum cans, tin cans, metals, cardboard, glass bottles. ***Please note that RR does not offer any rebates (money back) to the general public for these materials. If you'd like to be eligible for rebates at our Center, please click here to apply for a small business account with us. E-Waste (CHARGES MAY APPLY): computers, laptops, monitors, cell phones, electronic media devices (e.g. DVD players, VCRs, etc. ), printers, fax machines, cables, computer-related accessories (e.g. keyboards, mice, etc. ), small domestic appliances (e.g. microwaves, toasters, etc. ), and both cathode and non-cathode ray "tube" televisions (TVs). ***Please note that as of 1/1/18 we began charging $.45 per pound for drop-offs of all electronics except for complete laptops, servers, cables, and ports. Also please note that we do not accept any large appliances (e.g. refrigerators, washing machines, etc.). HaRM (PROCESSING FEES APPLY AND VARY BY ITEM): Styrofoam, light bulbs and lamps, batteries (all types except for car batteries), ballasts, and pallets. Food Waste ($1 PER GALLON): Fruits and vegetables (i.e. produce), meats, dairy, grains and carbohydrates, sweets, powders, compostable utensils and to-go bags, and more. *If you're looking for a way to transport your compostables to and from our Center, we carry blue 5-gallon buckets with locking gamma lids and recycling guideline stickers at our Center for $20 each. Alternatively, you can bring your own container from home (e.g. paper bag, reusable bag or tub, etc.). We're passionate about responsible resource recovery, and we love sharing the knowledge we've gained over the years with all those who are interested. Our co-Founder, Maria, is a former school teacher here in Dallas-Fort Worth, and she brought her passion for education with her. 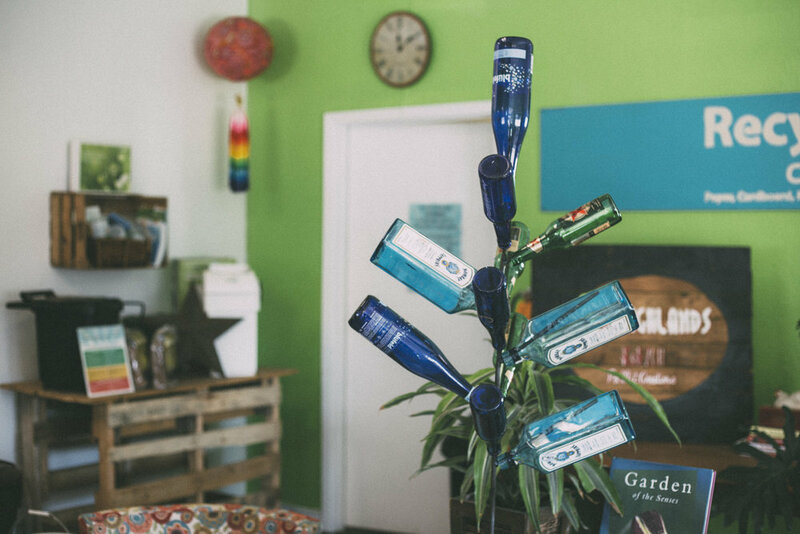 Our Community Drop-Off Center is family-friendly (we've even hosted the occasional children's birthday party! :D ) and we enjoy giving tours. If you're interested in coming by and learning a little more about the local recycling process or Recycle Revolution itself, don't hesitate give us a call to schedule a free tour. You can see some fun pics of our Center here. Our award-winning collection service for businesses may pay the bills, but like many small businesses, we didn't start RR just to make money. We're passionate about the work we do, and we're passionate about the city (and state!) we call home. For 10 years running, our Community Drop-Off Center has given us the opportunity to share our passion for responsible resource recovery with North Texans from all walks of life. Meeting like-minded neighbors who care as much about our community and the environment as we do makes our days more fun and rewarding, and helps us take our minds off of the hot Texas summer!